Ashok Leyland, flagship of the Hinduja Group, today announced the beginning of construction of its Bus Plant in Andhra Pradesh. The ground breaking ceremony marked the beginning of work on a Greenfield factory which will be the first Ashok Leyland plant in Andhra Pradesh. 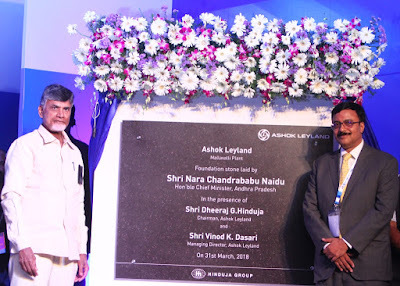 Situated in Model Industrial Park, Mallavalli Village in Krishna District, the auspicious ceremony was performed in the presence of the Chief Minister of Andhra Pradesh, Nara Chandrababu Naidu and Managing Director & CEO of Ashok Leyland, Mr. Vinod K. Dasari. Part of the fast upcoming manufacturing hub in Krishna District of Andhra Pradesh and located 40 kms from Vijayawada, this Ashok Leyland plant will be spread over 75 acres and will include latest technologies to deliver the high quality standards of the Ashok Leyland brand. The plant once fully completed would be able to produce 4800 buses per annum, and would also have a state-of-the-art learning center and an advanced service training center. The setting up of this plant will help increase the skill level of the employable workforce in the state of Andhra Pradesh and will have the potential to employ over 5,000 employees. While it will have the capability to make the entire range of buses of Ashok Leyland brand, the facility will also include an electric vehicle development centre comprising of a futuristic conveyor line, pilot assembly line and prototype development. It will be a complete green facility, with rooftop solar panels, LED lighting, battery operated vehicles for in-plant movement, positive water balance and zero discharge.